Happy Halloween from the land of Pandora!! When I first watched the movie Avatar in 3D I felt like it was more of a life experience then just a movie. I loved everything about it. It was phenomenal. 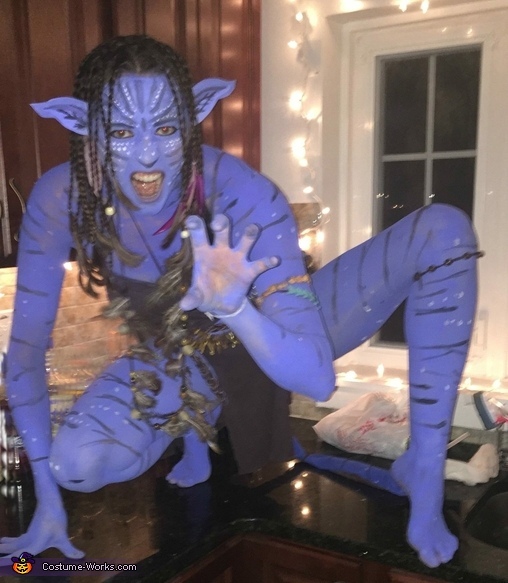 I wanted to become my very own avatar. Alas, Halloween this year was the year. I tried to keep the costume as cheap as possible. Using an old brown top from my closet and hot glue, I cut it up and made the top and loin cloth. I also cut up an old black shirt to make features and details on the tail (as for the tail body, I bought a $3 blue shirt from Michaels which I cut and glued together and then stuffed with magazine pages). I borrowed my boyfriends knife and knife sheath and looped it through a belt I already had and belted it around my hips. I had a bunch of coupons for Michaels so I got the rest of the supplies there for discounted prices. I got several jewelry beads, feathers, suede string, wooden beads, and most importantly, Snazaroo paint. To make my necklace, I put beads on the suede string and tied it in various patterns and hot glued on feathers and more beads. For the body paint, I bought a $1 water spray bottle and 2 dark blue Snazaroo paints, 1 black, and 1 white. Using a sponge, I mixed the dark blue and white paints together to make the na'vi skin color. And for the stripes, I mixed the dark blue and black. Snazaroo paint dried quickly and was easy to use. (Tip: I had watched Avatar makeup tutorial videos on YouTube prior to, to get some tips for the face.) I put blush, lipstick, and eyeliner on on top of the paint, to give my face an "alive appearance". I cut out ears from a cereal box and shaped them and painted the cardboard with the Snazaroo paint. (Most of all of this, I did prior to Halloween.) The day of Halloween, I had a friend come over and help me get ready. She helped with the base coat of the blue body paint (we did two coats) and she braided my whole head for me. Then it was the small details of a bead here, a feather there, some white dots here, and it all came together better than I could have imagined.